This week’s theme is neglected fishy bits. Salmon bellies and yellowtail collar—what you might call fish offal—though there is real fish offal like monkfish liver (ankimo) that is mighty tasty itself. Halibut cheeks are another example of a cut that is often (much) cheaper and still very tasty. There are times when it’s hard to translate a recipe from the kitchen to the page. I mean, I’m good at knowing when elements are going to work together in a dish and, yet, occasionally things go sideways. Particularly when I’m changing and adjusting the recipe on the fly. This happened twice this week. It wasn’t as though the dishes were inedible (though I was not super happy about my salt cod dish), it’s justthat they didn’t come out as I’d meant them to taste. I’ve been cooking with the beautiful salmon bellies from Monterey Fish lately and when a bunch of friends were coming over for poker on Friday night, I decided to use them. I had picked up some of their house-cured salt cod and thought I’d do that as well. 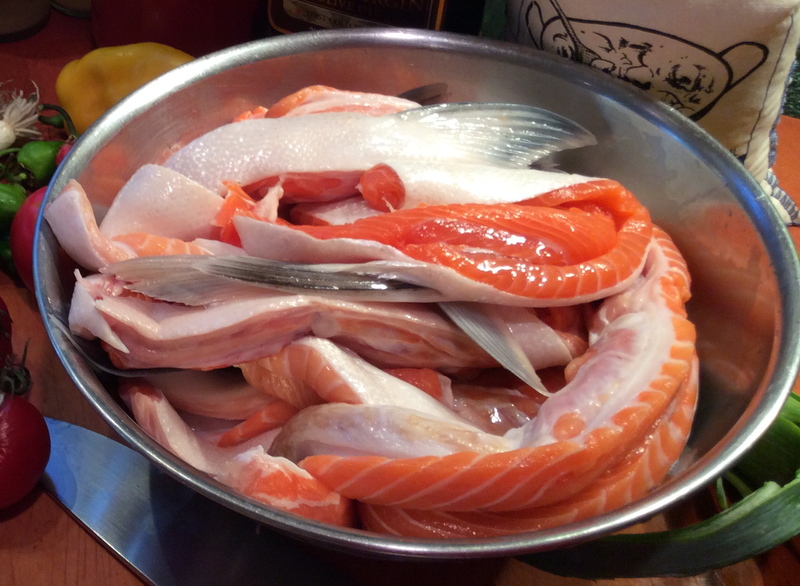 Salmon belly has a couple of things going for it—it’s really tasty, and, at $11.99 a pound, it’s quite a bit cheaper than the fresh King salmon it’s cut from. Usually I’ll just do a quick sear on the skin and fin side and then finish them in a hot oven. It’s great with just a little lemon or soy. I decided to go for something a little more make-ahead and do a paella sort of thing burying the bellies in a rice casserole full of leeks, tomatoes, peppers, and Spanish chorizo. It tasted good, and was even better when I made patties from the leftovers and sautéed them in some butter. But I didn’t think it really worked as a recipe, as I did too much fiddling as I cooked. Neither of these was going to work— what could I make? 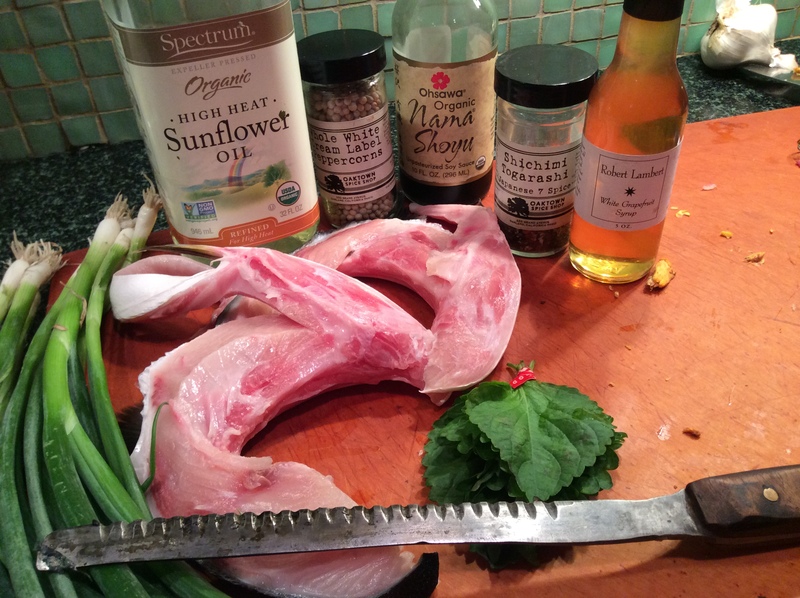 When I saw some hamachi kama (yellowtail collar) at the West Berkeley Bowl, I figured I was on some kind of fishy-bits roll and here was my answer. And the collars were $5 a piece, giving me a little over a pound for $10. 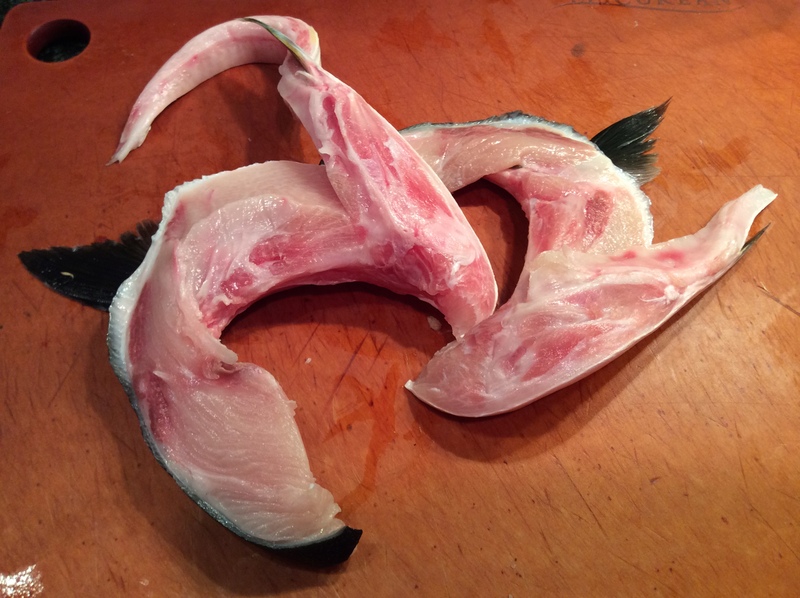 If you’re familiar with sushi, you’ve likely had hamachi fillets. The collar (or kama) is the section behind the gills and head of the fish. It’s a boney thing, but so, so, good. It’s usually grilled, broiled, or roasted, and it is simplicity itself to make. Preheat the oven as high as it goes—I got mine up to 525°. Open a window and turn on the kitchen exhaust fan if you have one, as this can get pretty smoky. 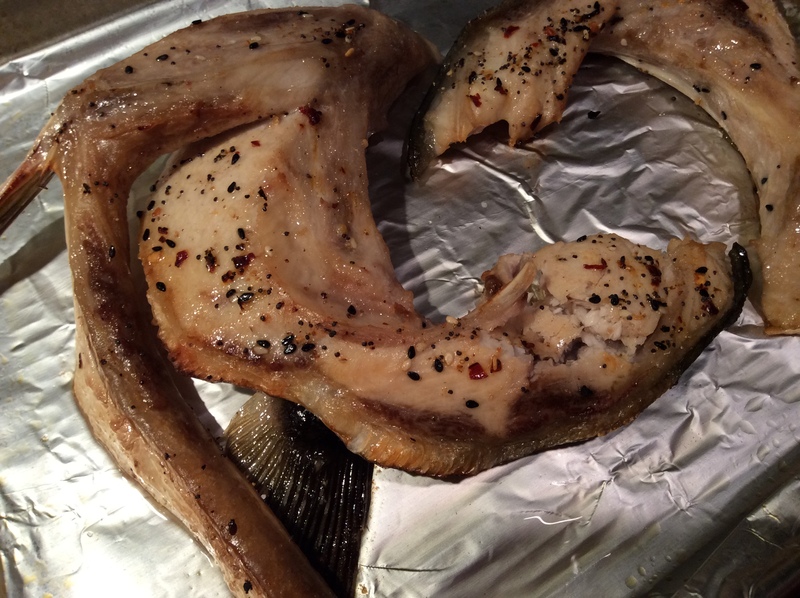 Rub the collars with the oil, and add salt, pepper and shichimi togarashi, then set aside while the oven gets hot. Put collars on a sheet pan covered with foil and place in the middle of the oven. Cook for six to eight minutes, depending on the heat of your oven. The collars should have some color to them. 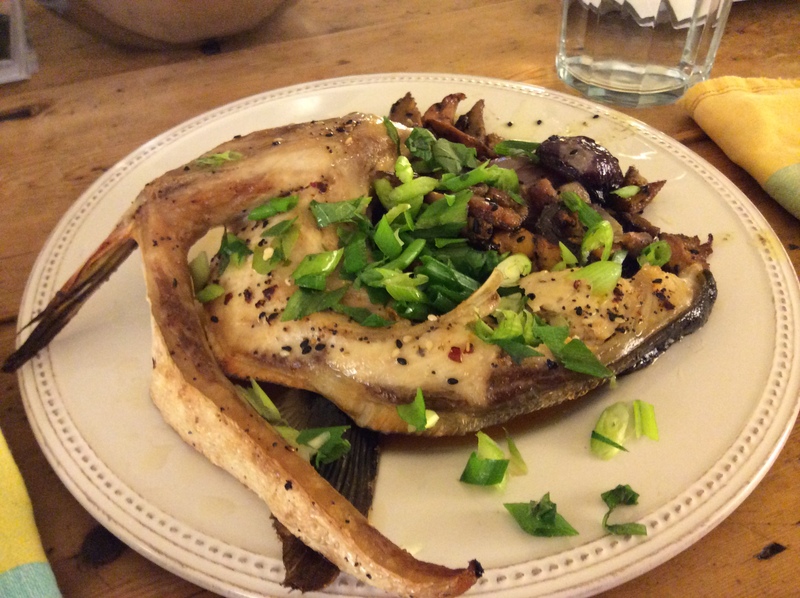 While the fish is cooking, chop the scallions and shiso leaf up into bits and set aside. Mix the soy, grapefruit syrup, and lemon juice together in a bowl. When the fish is done, plate and pour the sauce over the collars, and add the scallion mix. I served this with some chanterelles, Cabernet onions, and pancetta that I’d roasted off. You could go with some chard or kale or broccoli rabe, or another green. You can substitute salmon bellies for the hamachi if you can’t find it. I got the shichimi togarashi from Oaktown Spice. It’s also called Japanese seven spice. The white grapefruit syrup was from Robert Lambert, who is at the Grand Lake Farmers Market every other week with his tasty condiments. If you don’t have that, you can use ponzu or another dipping sauce. If you can’t find shiso leaves, you could use mint. I’m going to be in Pittsburgh next week for my mom’s birthday, and I’ll try to post a recipe from there. There is a great farmers market in the Strip district at the Firehouse. 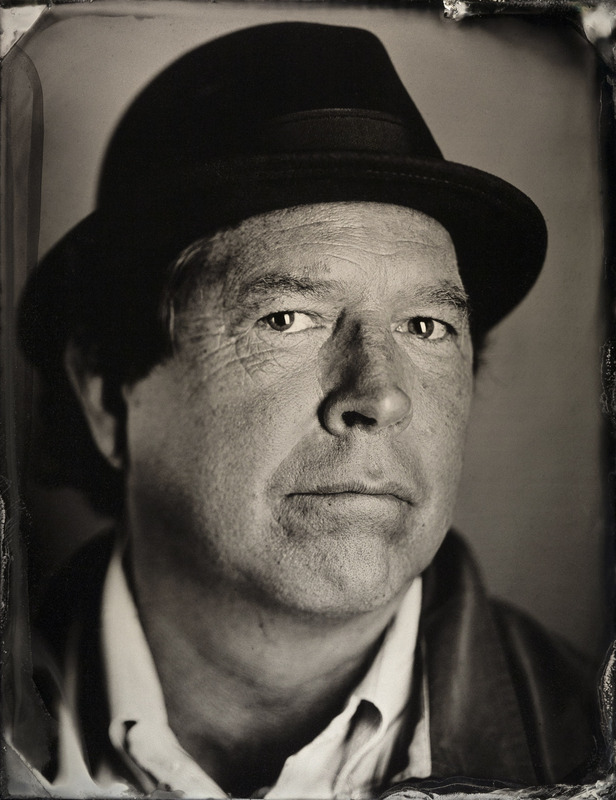 This entry was posted in Eat and tagged Monterey Fish Market, Peter Moore, salmon, The Secret Restaurant. Bookmark the permalink.